Perimeter Drainage has been the leader in design, installation, and maintenance of residential drainage systems for almost 20 years. Our installations are the best in the business. 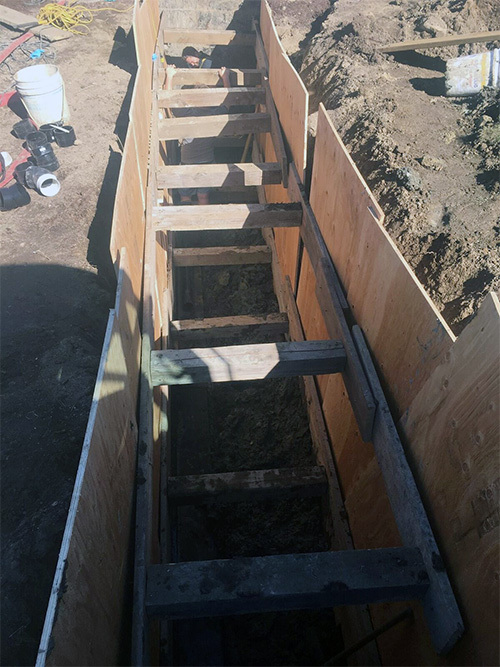 Our installs include proper parging of your foundation with high strength concrete, application of damproof or elastomeric waterproof materials on your foundation, Delta Membrane, and BC Plumbing Code proper two-pipe installations. If you need pumps, check out our Pump Station page for why you would need to pump your drainage. Why worry about flooding when you have the peace of mind with one of our 5-year guarantee, leak free systems installed. Read below to determine if you have a drainage issue and how it can be rectified. Signs that your drainage may have failed can range anywhere from having a damp basement to a full flood. Flooding can mean just a small portion of a room to the entire house. This action may be a result of several common problems. You could have a blockage in your perimeter drainage. The most common causes are a tree roots, collapsed tiles, debris in the line, or just natural aging of the pipeline. You could have a crack in your foundation, or your foundation could be porous. Your pumps (If you pump your drainage) could have failed due to improper maintenance, failed float, or a power outage. If any of these 5 problems are present, you may experience a flood. Regular maintenance on you drainage system would greatly reduce the risk of flooding. If you have experienced a flood, we have the tools to properly diagnose and repair the problem. We start with a video diagnostic inspection. You will receive an exact diagnosis of all your drainage problems, which allows for a quick determination of the best solution. If we find that you are required to replace your drainage system, the following steps are taken in order to successfully complete the job in a timely and professional manner. (Every scenario is unique; this is a typical guideline). We excavate along your foundation down to your house footing. This is where your drainage tile is. The drainage tile is removed and the trench is properly graded allowing water to flow naturally to your sump. We pressure wash the foundation wall and repair any cracks or honeycombing. (Refer to foundations section) We then apply two coats of foundation damp-proofing material. If you live in an area with high ground water, a dimple membrane is installed since damp proofing is only effective against three pounds per square inch of water pressure. Perforated PVC pipe is installed around the full perimeter of your house. Drainage rock is installed over top of your PVC pipe. Solid PVC pipe is strategically installed to collect all roof and ground water before it discharges into the district storm connection. If you have a district storm connection, a solid pipe is installed to connect your sump to the district storm connection. A district plumbing completes a full inspection of the installation before the site is backfilled. Most of these jobs last seven to ten days, but will vary based on different situations. If you suspect that your drainage needs to be assessed, call us and we will send out one of our qualified service technicians for a no obligation quote.